A special blend of chemicals which when added to a central heating system reduces noise from the boiler and radiators due to limescale or sludge build-up. Knocking and kettling are usually attributed to hard water and limescale and sludge deposit formation on the heat exchangers surfaces. These deposits reduce heat transfer which increases fuel bills and reduces service life of the boiler. 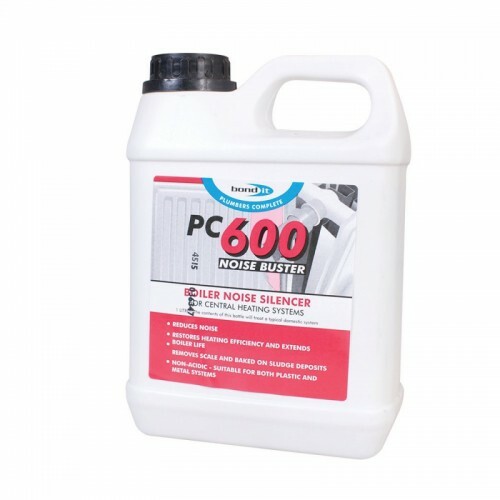 For best results pretreat the system with PC400 Flushchem prior to using Noise Buster. Ensure that after pre-treatment with Flushchem the system is treated with PC100 or PC200 Inhibitors. Shake the bottle of PC600 and add the entire contents into the central heating feed and expansion tank. PC600 will be gradually drawn into the system over a period of up to 6 weeks. Bleed radiators after 2-3 days and again after 2-3 weeks after this time a noticeable difference should be heard. For combi systems add to a partially drained radiator.